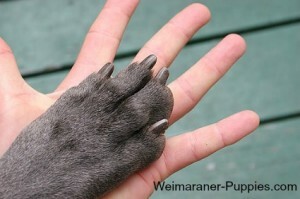 Trimming dog nails, is not great fun for either you or your Weimaraner, it is still important for maintaining his healthy paws and preventing mobility issues. If your dog’s nails get too long, walking can jar the leg bones and aggravate joint issues. And the nails can get in the way, making it more difficult to walk, run and jump. Long nails can even cause your dog to slip and fall. Do dogs like to have their nails trimmed? If you are lucky, your dog will sit nicely and let you trim her nails. However, some dogs are not as cooperative. If your dog has had a bad experience, and her nails were clipped so close that they bled, she may be nervous and fearful of having her nails trimmed. However, trimming your dog’s nails does not have to be a difficult ordeal for you and your Weinheimer dog. If you make nail trimming a fun activity, you will both look forward to this time spent together. 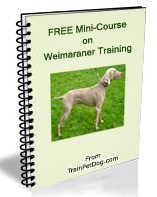 Keep your Weimaraner’s nails trimmed, to avoid problems. To trim your dog’s nails, you will only need a few tools. However, like any other project, using high quality tools will make your job a lot easier! Nail Clippers – There are nail clippers designed especially for dogs. When shopping for dog nail clippers, look for one that has a safety stop on it. This prevents you from cutting too close to the quick. This professional dog nail trimmer is for large dogs. It is sharp, easy to use and give you a clean cut. Dremel Grinding Tool – You may have seen one of these on T.V. The Dremel Grinding Tool works better than clippers with some dogs. The grinder is like a little sander or emory board that sands off the nail ends. Before you use this tool, you should de-sensitize your pet by getting her used to the tool, before you try to trim her nails. That way your dog won’t be afraid of the noise and vibration of the grinder. The grinder comes with directions on how to do this. Some dogs are afraid of the Dremmel tool. But, other dogs find the Dremmel tool to be an easy, painless way to shorten dog nails. Especially if you have a dog who is afraid of the dog nail clippers. Styptic Powder for Pets – This is one item that you should never be without. Although you do not want to hurt your pet, you cannot avoid accidents from happening. If you cut through the quick, this will cause pain and bleeding. Use silver nitrates or styptic powder to stop the bleeding. Unlike human nails which are basically flat layers of keratin with a hidden blood supply, dog nails are living attachments with a blood supply and sensitive nerve endings that run directly down the center of the nail. This is called the “quick.” Trimming dog nails too short will cut through the quick, and will cause bleeding. So be very careful in trimming dog nails. What if You Have an Anxious Dog? Since the Weimaraner belongs to a family of large dogs, try sitting on the floor with him, if you are grooming your dog at home. You can place his paw on your lap while you trim dog nails. If your dog is anxious, and many Weimaraners are nervous about having their nails trimmed, you can try using a natural or mild sedative to calm him. Natural Sedative – This natural sedative dog treat is a dog supplement that soothes nervous dogs. It is easy to give to your dog. He’ll look forward to his treats. And it does work! By the way, since Weimaraners tend to be high strung dogs and often suffer from separation anxiety, you can also use this product to help calm your dog when you need to leave him for awhile. calm down, and will be easier to handle. The shirts gently compress the dog’s torso, and this is calming, without the use of any supplements. By the way, Thundershirts are also good for dogs that have separation anxiety or who are afraid of thunderstorms. Once your dog is ready, locate the quick so you’ll know how short you should clip dog nails. Cut the nail below the quick on a 45-degree angle, with the cutting end of the nail trimmer toward the end of the nail. Gradually shorten the nails, one at a time. It is more difficult to see the quick on dark colored nails than on light colored nails, so you should cut it in several small cuts to decrease the chance of you cutting into the quick. Don’t forget the dewclaws located on the inside of the front and/or rear legs unless they were already removed when your dog was still a puppy. Use a nail file to smooth the surface. Do not rush when it comes to clipping your dog’s nails. Help your dog feel relaxed and comfortable. If you do this, cutting his nails will become a normal part of your routine. Trimming your dog’s nails is not just for appearance. It is a part of keeping your dog physically healthy.